The first gourmet Boba/Tea bar truck. We feature over 100 unique flavors, all of which are freshly brewed one cup at a time. The Boba Truck is a fully customized gourmet tea / boba bar on wheels. We utilize the latest tea brewing techniques to offer our customers a freshly brewed cup of tea one serving at a time. We import ourselves only the finest teas from all around the world. 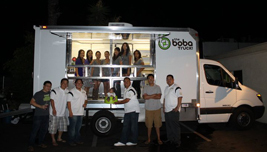 To learn more about The Boba Truck, visit us at www.thebobatruck.com!